Jupiter and the Milky Way can be seen in astrophotographer P-M Hedén’s tranquil photo taken near the Dal River in Sweden on September 2011. 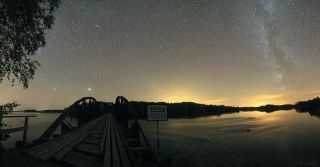 The majestic planet Jupiter soars over an abandoned bridge in a beautiful photo captured by a Swedish skywatcher. In the image, the gas giant planet hovers over a 100-year-old railroad bridge that was once used to cross the Dal River near the village of Gysinge in Sweden. Jupiter shines like a beacon against the stars speckling the night sky. Astrophotographer P-M Hedén of The World at Night snapped this serene photo in September 2011. Jupiter is the largest planet in our solar system and one of the brightest objects in the night sky. The planet can be easily spotted through telescopes and often appears vivid and colorful in images. Also visible in the southwestern horizon is our own Milky Way galaxy. The Milky Way is best viewed during late summer nights through very dark skies. While this stretch of stars, galaxies and nebulas often dots our skies, it can be difficult to spot the Milky Way if there are other luminous light sources nearby.